JOHNSON COUNTY, Iowa — In the margins of time between social engagements lives a local food movement available to all who seek it. There is inadequate time in life’s span to become an enthusiast, however pursuit of local food culture is not only okay, it can be rewarded with meals that comfort more ways than imaginable. While Jacque was in town with her sister, I made last night’s supper of seconds of poblano peppers and yellow onions from the farm, a couple of links of vegetarian sausage, and a variety of home made pickles. After removing bad spots from the onions and peppers, I cut them into thin strips and piled them on the cutting board. I cut the sausages on the bias and browned them in a pan. Once finished, I removed them to a paper napkin sitting on a plate and began sauteing the onions and peppers in olive oil, seasoning with a bit of cilantro, granulated garlic, salt and pepper. While the vegetables were cooking I arranged three kinds of pickles, sweet, dill and daikon radish in a bowl. Once the vegetable mix was finished I spooned it into the bowl beside the pickles and topped it with the cooked sausage. With a glass of iced water, it made a meal. After dinner I went downstairs and checked the crock full of cucumbers. 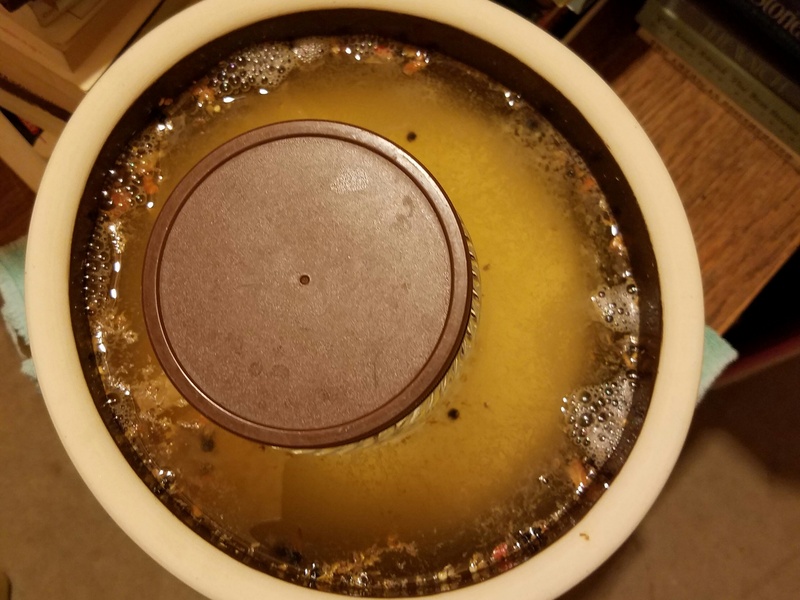 Fermentation bubbles had begun to appear after two days, indicating a successful pickling process. Patience is a key ingredient when making pickles. I hope I have enough of it on hand to make it 11 additional days when the dill pickles will be ready to eat. Simple stir fries and pickles become a way of life when vegetables are available from the farm and garden in abundance. Cooking in the local food culture is an act of rebellion from a consumer culture that engendered us in the Western hemisphere. It represents taking control of our lives. Do I always cook locally produced food at home? No. I pay attention to the seasonality of food and align with it as much as possible. I’ve found it makes for better ingredients and depending on the cook, for better eating. There is more to the seasons of food than common affection for sweet corn and tomatoes. Learning more is a step toward living a better life and who doesn’t want to do that? This entry was posted in Cooking, Local Food and tagged cooking, local food, onions, peppers, sustainability. Bookmark the permalink.